Let me introduce you all to Ayden. Ayden is a nonverbal 8 year old boy who is sporadic, energetic, fun and very loving little boy. He was diagnosed with autism at the age of 3. 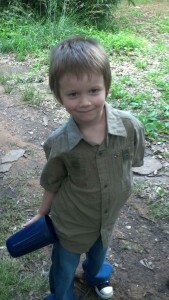 We were blessed enough to be able to adopt Ayden at the age of 5. Ayden fills our days with singing with his high pitch noises, the rocking, the spinning and flapping of his arms as he dances his way around our home. Days filled with love and so much compassion. But he also faces challenges every day, which cause him fear and anxiety that he doesn’t understand. Socially he has trouble going places because of the noises. Like traffic noise and humming noises from lights at the stores. Different pitches or tones cause his little ears to hurt. The overwhelmed feeling when too many people are around. Anxiety and fear set in to cause mayhem in his little mind. With all of the bad there is also good. Ayden loves to swing and play in the water. During the summer months he will take 4 or 5 baths a day, just so he can play in the water. We would love to be able to let him go outside to run and play in the water in the yard. Just as many of us did when we were kids. I remember the days I spent playing in the water outside. But we can not let him go outside to run and explore without having a strong grip on his hand. Ayden is a very fast runner and he can easily get away. Mommy just isn’t fast enough to keep up with him. So with every little pull and tug, our hands grip tighter to his. You see, he knows no danger. To him its all to explore. Ayden has learned so much since the day he became our little boy. I remember the day like it was yesterday. Ayden was in the living room playing while I was in the kitchen fixing lunch. I noticed things got quite, so I walked around the corner to peek in on him. He was gone and the front door was wide open. He had learned how to unlock the dead bolt on the door. I ran out the door screaming his name, knowing he couldn’t answer my call. As I frantically ran around the side of house, there he was playing in the dogs water bowl. I think God each and every day that no harm had come to him. You see, we live on the river and that is the most scariest place to live with an autistic child. Children with autism are usually drawn to water. My biggest fear is he will bolt or get out of the house and head for the river. This is every parents nightmare, but when you have an autistic child that nightmare is 10x worse. Having a fence is more than just having a fence. It is life chancing for Ayden and for us. It opens up a whole new world for our little boy.